Gone with the Wind is not my favorite movie in the world. Not by any means. There is also a perfectly logical reason for this--the book is one of my absolute favorites and I read it long before I saw the movie. I was truly horrified the first time I saw Gone with the Wind. Now, having gotten used to it some, I like it fairly well, and a few weeks ago I took it to school because we were studying the American Civil War. Well, actually, the real reason we wanted to watch it is the fact that it is nearly four hours long, which equals at least four study-free classes, enough to win over the most anti-old stuff people in my class. In fact, one of the anti-est ones of them all suggested we watch it in the first place. The first thing I can say based on this experiment is that GWTW is possibly the worst movie to show to non-native English speakers. (I live in Kuwait.) I'm sure that if my classmates had been able to decipher the characters' accents, they would have understood all the words. But let's put it this way: my own grandmother, who is American, saw Harry Potter 6 with me this summer and understood nothing of the first ten minutes, thanks to the actors' British accents. And yes, she can hear fine. Just imagine a foreigner trying to figure out southern accents and southern black accents. And, admittedly on a ten year old tape with commercials and sorta bad sound. Suprisingly, the people who actually watched GWTW intently enough to figure it out liked it. We never finished it, but one girl found the video online and later told me she cried over the end. And everybody thought Clark Gable was ugly. Good. I don't get his appeal one bit--I just can't decide whether it's an ape or a loving cup he looked like. And of course, Leslie Howard never stood a chance. GWTW should win an award for most unappealing men. Perhaps the funniest thing that happened was at the beginning, when Gerald O'Hara rides home to Tara, where Vivien Leigh waits for him. I had provided some background to my classmates--basically that it was a love story--and at the sight of Gerald, one girl cried out, "Please don't tell me that's the guy she falls in love with!" :-) Speaking of Gerald, one thing most of my more modern friends never fail to point out is how unrealistic his death is by contemporary standards. I'm not sure that's true...but it shows how much modern movies put their characters through without them actually getting harmed. And of course there were several death predictions. Surprisingly, a couple people even thought Scarlett was going to die. An interesting alternate ending. Scarlett would never have killed herself, but say Bonnie had never been born, Melanie had died as usual while Scarlett was visiting family or something, Ashley and Scarlett had become lovers, and Rhett, in a jealous rage, had shot them both. Akkh. Methinks I should stay away from fan fiction. Most of Scarlett's stay in Atlanta prior to her flight to Tara. Of course, she needs to be in Atlanta, but what happens during this time in the book could be called the Corruption of Scarlett. Here she falls under Rhett's influence and we see Rhett's popularity rise and plummett in Atlanta society. You don't get much sense of this in the movie. According to my mother, you get the feeling Scarlett was always the way she was. Of course, that could all have been left out. But then why would the scene where Rhett gives Scarlett a green hat have been included? Does the movie make it clear that by wearing the bonnet Scarlett is scandalizing Atlanta because she has come out of mourning years before it is proper? What about when she dances at the bazaar? Did you realize that Scarlett eventually takes everything Rhett says to her about reputations and such to heart? Do you realize that before her relationship to Rhett Scarlett cares far more about propriety? Do you realize that Rhett is considered an incredibly wicked man after the glamourous mist surrounding his blockade running evaporates? I feel that they are only hinted at in the film. And worse still, almost all of them are hinted at. So you get are too many things going on that seem to have little bearing on the overall plot. Rhett declares his love far too often. One of the main reasons his and Scarlett's relationship doesn't work is because each think the other doesn't love them. The main scene I am talking about is right before Bonnie's death when Rhett declares his love to Scarlett and suggests she sells the mills. Sadly, it doesn't work for Scarlett to have known Rhett loved her before he leaves her. This would mean that if she thought about it, she would have realized why Rhett did all the things he did that she dismissed. Like their wild night. At first, she thinks, "Oh, I've got him now, he really does love me!" but he convinces her he was simply being despicable. The way Scarlett acts here, thinking Rhett loves her, seems out of character compared to her reaction later. Rhett also shows a bit too much emotion for us to buy Scarlett's willingness to believe he doesn't care for her. She would have to be quite unintelligent to not be triumphant and superior when she kicks Rhett out of her bed and he breaks down the door. That is the way Scarlett acts when she thinks she's "got somebody." First, he says he doesn't care. Then, obviously he does. Scarlett reacts to the first point but not to the second. Not very credible, in my opinion. Scarlett's marriage to Charles. The reason given for this in the movie is Scarlett does this to hurt Ashley. However, they also include the scene where India, Melanie, and a few other girls talk about Scarlett behind her back as they walk down the stairs, much to Scarlett's dismay. There are a few things wrong with this. Scarlett is upset by their words, but she isn't really the type to be bothered by the things people she doesn't like say. Why exactly is she upset in this scene? It should be fairly obvious to her that people know she likes Ashley Wilkes because they have said as much--Mammy and Suellen, for example. In the book, the real reason she is upset is because she had not realized anyone knew about her feelings for Ashley. When she finds out India Wilkes does know (in the book, it's Honey Wilkes) she thinks she'll be the laughingstock of Jonesboro and her family will be ashamed of her (remember her father telling her not to run after a man who doesn't love her?). This is one of the main reasons for her impulsive marriage. Scarlett reasons that marrying Charles will: a. Make India look like a fool for thinking she loves Ashley, b. Convince Ashley she was only flirting with him, c. Get back at India because she's the one engaged to Charles, and d. Get back at Melanie by marrying her stupid, naive brother. There would have been nothing wrong if the screenwriters had only had hurting Ashley be Scarlett's motivation, but then the staircase scene sh have been left out. Scarlett's nightmare. I believe this should have been left out entirely. GWTW would have been too complicated had the symbolism of the dream been elaborated on to the point where it had the proper impact. In the book, it has two purposes. First, it shows how Rhett comforts Scarlett in much the same manner he later comforts Bonnie; and second, it parallels Scarlett's search for security. The movie could easily have handled the Bonnie theme without Scarlett having nightmares and the search for security is basically left out. Have you ever wondered why there is so much fog in the ending scene? That is because in the book, Scarlett is actually experiencing her dream in real life. She always dreamed she was running through the mist, looking for something, but she never knew what it was, only that she had to find it. In the end, she realizes this thing is Rhett, the one person who has never let her down. Without knowing that, the dream motif is meaningless in the film. Rhett's proposition. This was a scene obviously left out because of the censors, but I believe it would have been worth figuring out a subtle way to get the meaning of the scene across, like they did with the green dress in the jail part. I think it should have been put in because it is drawn upon in at least two scenes later. First of all, the green dress scene, when Scarlett says, "You once said you wanted me." If Rhett had never asked Scarlett to be his mistress, she would have been taking quite a risk by assuming this--and, if she had deduced this, why does she fail to realize just how much Rhett cares for her? The other scene is when Rhett proposes to Scarlett and she doesn't take him seriously. In the book, she thinks he's asking her to be his mistress again. She doesn't have much of a reason to think he's joking in the movie. Leasing convicts. Well, it has a small purpose, but I think Scarlett's corruption would have been better illustrated if they had elaborated on something they had already mentioned--like the mills, pressing old friends for money, riding around unchaperoned, etc. The rest of the plotlines concerning the convicts were left out, and they had more meaning than the simple fact that Scarlett leased convicts. These things may seem small in themselves, but there are probably more of them, and they weaken the plot and make the entire movie far less moving. If GWTW had had some focus, more theme development, and fewer themes so that would have been possible, it would have been a remarkable film. Of course, I can't say there aren't several positive aspects to GWTW. It does a fair job adapting the plot, it's interesting for three and a half hours, and the clothing and people are gorgeous. I'm writing an extremely negative review because there are so few of them. Where are all the other dissenters? I know I'm not the only one. Isn't there someone who dislikes the movie for artistic reasons and not because of racism or melodrama? Anybody? FASCINATING! I don't know HOW I missed this?!??! 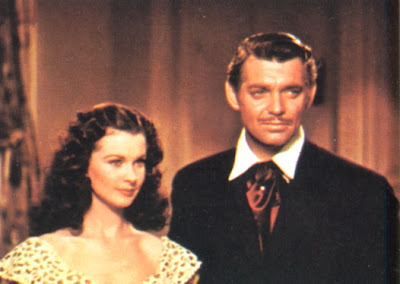 CLARK GABLE DOES NOT LOOK LIKE AN APE ORRRRRRRRRRRRRR A LOVING-CUP! SHEESH!!!!!!! Aww Thank you Millie! I really appreciate your comment. Except the part in all caps. Because he does. Um, no, he doesn't. That's just not cool. Why don't you like him? Did you try to marry him or something, but he didn't like you? As much as I love GWTH the movie, I agree with most of the points you make in your fascinating review. The book was indeed endlessly better and the movie only truly works if you are familiar with the book. Although Leslie Howard was dreadful as Ashley (a young Robert Montgomery was needed for the role), Clark Gable was absolutely perfect as Margaret Mitchell's dashing Rhett. Perhaps even better looking since Clark had a straight nose. I was surprised that not once do you ever mention Vivien Leigh and her towering performance. Although Vivien's breathtaking beauty is at odds with Miss Mitchell's description of Scarlett, she is the perfect Scarlett in every other way. Surely you agree. Thank you for your nice comment, TrippyTrellis! Yes, I certainly think Vivien Leigh was the perfect Scarlett. She wasn't the way I expected Scarlett to look, so I was surprised when I first saw the movie, but after I got used to her I realized she was Scarlett. About Clark Gable...well, I don't like him very much, but I have to admit that he's the closest thing to Rhett there probably is. I mean, you know someone looks like a character when the worst thing you can say about them is, "His cheekbones are too high!"